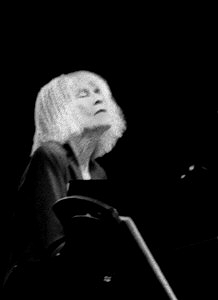 Carla Bley (born Lovella May Borg, May 11, 1936) is an American jazz composer, pianist, organist and bandleader. An important figure in the free jazz movement of the 1960s, she is perhaps best known for her jazz opera Escalator over the Hill (released as a triple LP set), as well as a book of compositions that have been performed by many other artists, including Gary Burton, Jimmy Giuffre, George Russell, Art Farmer, John Scofield and her ex-husband Paul Bley. Listening is more important than anything else because that's what music is. Somebody is playing something and you're receiving it. It is sending and receiving. I don't need much coaxing. One performer whose band played my music better than I could myself was Art Farmer. He recorded 'Sing Me Softly of the Blues' and 'Ad Infinitum'. There are times when what's happening in rock is the best music in the world, and there are times when there is nothing worthwhile at all.